Microsoft released Windows 10 Insider Preview Build 18282 (19H1) to Windows Insiders in the Fast Ring on November 14. 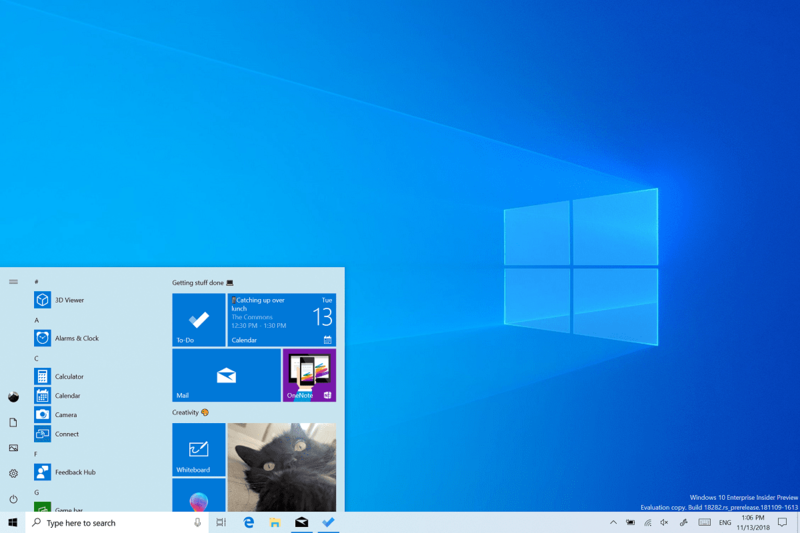 While the next Windows 10 iteration 19H1 includes several improvements and bug fixes, it also introduces a true Light theme for the Taskbar, Start menu, Action Center, touch keyboard, and more. Previously, if elements like the Taskbar, Start menu, Action Center, touch keyboard, etc., would be left out if one selected the Light theme. However, this changes with the new build. “Ever since we introduced the ability to choose between light and dark in Windows 10, we’ve heard feedback asking for a truer separation between the two options,” Microsoft said in a blog post. To enable light theme in Windows 10, you need to go to Settings > Personalization > Colors. Then, click the drop-down under ‘Choose your color’ and select Light. The new theme changes many elements of the OS UI, including the taskbar, Start menu, Action Center, touch keyboard and more. If you select the Light mode in the Settings app, all system UI elements will look lighter. “When you update to this build, your system color won’t automatically change to the new light system color. This is because we want everything to be exactly as you left it before you did the update. We’re leaving the choice up to you,” Microsoft added. As part of this new Light theme, Microsoft is also adding a new default wallpaper highlighting Windows Light. Go to Settings > Personalization > Themes and select Windows Light to apply it. This will change your PC to be light themed. The UI change to Light theme is not ready yet. Microsoft is likely to introduce the new Light theme in the upcoming Windows 10 19H1 feature update due in Spring 2019. The other notable changes in Windows 10 19H1 update are improved Action Center, dark themed OneDrive and more. Furthermore, there is also a new window snip option for Snip & Sketch, improvements to the printing experience, and more. Check out the general changes, improvements, and fixes for build 18282 here.